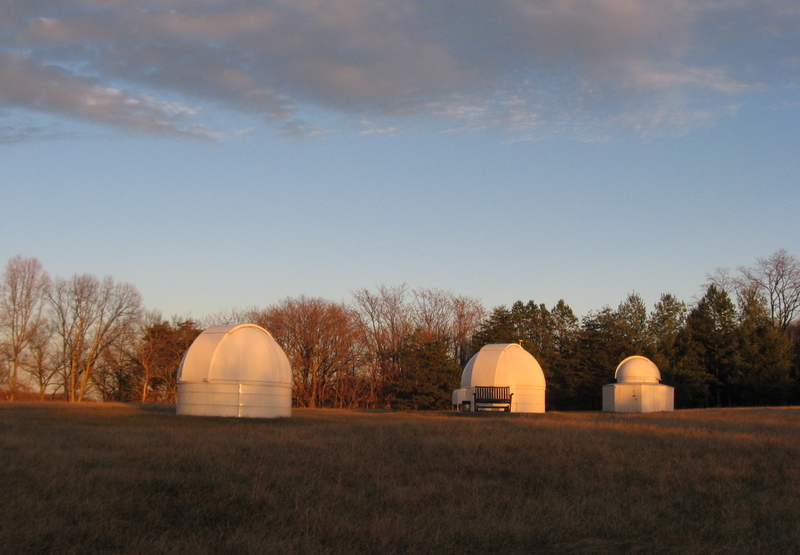 Our observatories are located in Barnesville, MD, about 35 miles NW of Washington DC. You can see in this Google satellite view that the domes are located in an open field about 400' from our house. There are no lights from neighbors or our town, Barnesville, which has a population of just 160. But we are at the northern border of a large suburban county with encroaching development within ten miles. Typical “good” night visibility is about mag. 3.5 to the North, and about 2.5 to the East. The best nights are about 1 mag. or better, but many nights are worse. Seeing is generally only fair (typical of the Mid-Atlantic) at about 3.3-3.5 a-s. However, several times a year seeing will allow imaging in the 2.3-2.5 a-s range -- very good for our area. There are three observatories at Starlight Farm. At the far right in this photo is a six foot Home-Dome, owned by our friend and colleague, David Yaney. It is equipped with a Meade 12"RCT and SBIG camera. The two Menke observatories are both 10 foot Pro-Domes, designated "Big Dome East" and "Big Dome West" (BDE and BDW). Both are Pro-Domes from Technical Innovations (yes, the domes we built when we were in the dome manufacturing business.) The observatories are located about 400 feet from our office/home. Each observatory contains a PC, connected by a wireless link to our office, for remote control using Digital Dome Works. We control Digital Dome Works, the scope, CCD camera, and other devices (including an in-dome video camera) using RAdmin software operating over the network. The older (East) PD-10 has a very long and honorable history. 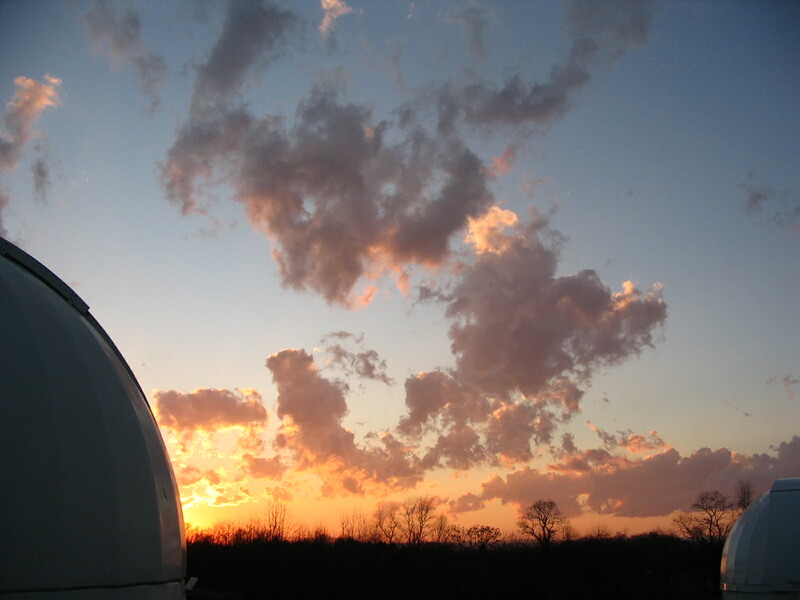 The current dome eplaced the very first HD10 that we produced in the early 1990s, which in turn replaced a home-made metal observatory from the mid-1970s. BDE originally housed a 6-inch, f/12 Astrophysics refractor. This telescope is an unusual design, with two internal flat mirrors that serve to shorten the tube length and make the scope more convenient to use. Its superb optics are the same as the “Super Planetary” that AP made several years ago. In the quest for more light, we replaced the 6-inch refractor with a C11 f/10 optical tube assembly with RoboFocus. The scope has several finders, including the 1x wide field and a standard 7x50 finder, as well as a video viewfinder built with an old 50mm projection lens (this allows rough remote pointing of the scope). On the side of the C11 we have also mounted the optical tube assembly from a Meade 2045 4inch SCT f/10 telescope. While this can be used as an external guider, we primarily use it with an f3.3 reducer and ST402 camera as a wide angle imager (about 30x40a-m field). The usual setup for this scope uses an ST7E camera with CFW8 filter wheel, which is typically operated with an f6.3 reducer yielding just about 1 a-s/pixel. The camera is controlled using MaximDL. Using the f/10 setup, we also use a DSS7 spectrometer with an ST402 camera to record spectra of planetary nebulae and comets. Of course, on occasion we use Barlows to obtain f/20-f/30 in imaging planets and small nebulae. 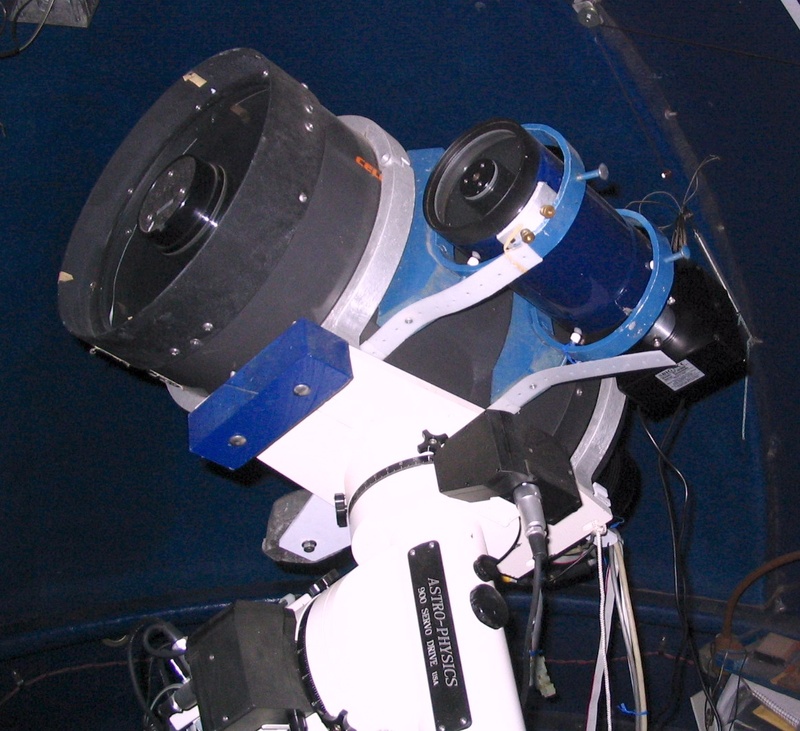 The C11 scope is mounted on a superb Astrophysics 900 GTO mount. The mount has a very low periodic error of about 3 a-s peak to peak (uncorrected). The pier is unusual. It is a 10 inch diameter, 1/4 wall steel pipe resting on the observatory pad (i.e., not in a separate footing), and is held down with three tension rods. The pier and mount will tilt approximately 2 a-s when a person moves from one side of the observatory to the other. We installed this pier to demonstrate that sometimes one does not need a pier that goes to China! The scope is controlled remotely using TheSkyV5 and Tpoint. The picture shows the ST402 (borrowed from BDW) mounted on the four inch scope as used for wide angle comet imaging. The newer (West) PD-10 was installed to house a new 18inch f3.5 Newtonian telescope completed in 2007. This telescope features a very thin mirror (1 5/8 in. Pyrex), an octagonal carbon fiber tube, and home-built mirror cell and diagonal holder. The focuser is a RoboFocus driven Clement focuser. 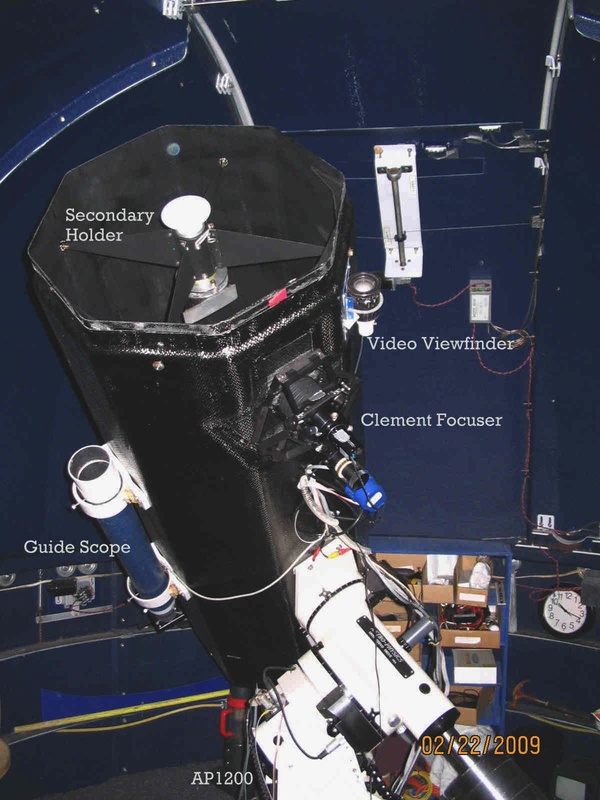 This telescope is described in gory detail in a PDF file that you can find here. Because of the fast optics, the coma is severe even in a small chip camera, so I use a Parracor corrector which yields an effective f3.9 telescope with about 1 a-s/pixel resolution. Both optical and video viewfinders are included with this telescope, as well as an external 3-inch telescope (home built) with DSI camera used as a guider. 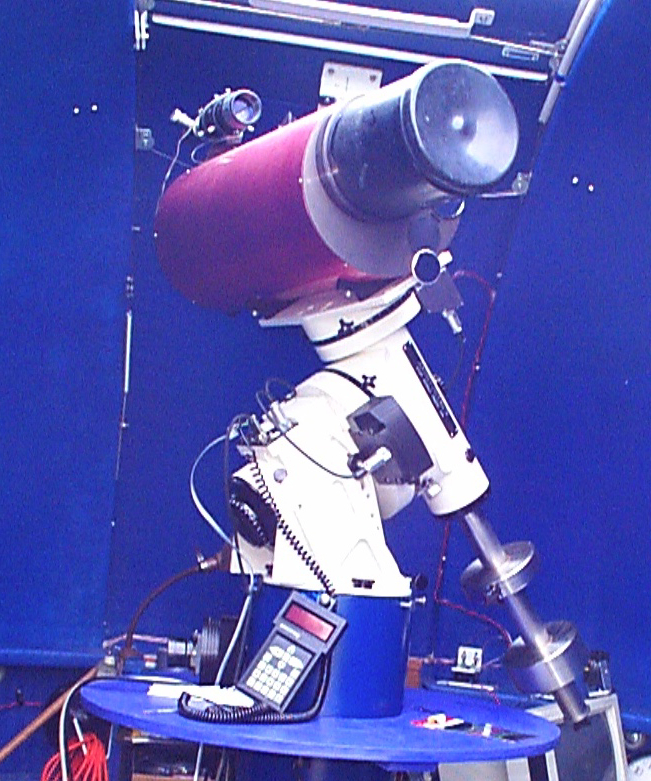 A typical setup for this scope uses an ST402 camera (not shown) with internal RGB filter wheel, or sometimes with H alpha and other filters for imaging. Although the 402 does not have photometric filters, the G (green) filter is very similar to the photometric V-filter which I use as needed. The N18 scope is mounted on an Astrophysics 1200 mount having about 2-3 a-s periodic error (uncorrected), which is controlled remotely using TheSkyV5 and Tpoint. The pier is a steel pipe in a concrete pier. One challenge is keeping the mirror clean. While I keep the scope covered most of the time, the most important practice is to keep heat on the mirror to prevent condensation that attracts dirt. The mirror stayed quite clean, but after a year I decided it was time to give the mirror a bath. I removed the mirror and cell, and then garden carted it to my house. Photos of how I did this cleaning job are here. I use the observatories for a wide variety of studies. I do relatively little visual work, primarily planetary and lunar observing. Most of my activity is in astronomy research, in which an amateur with relatively modest equipment can contribute to real astronomy research. Some of this I do by myself, some in collaboration with other amateurs, and some in collaboration with professionals. The Internet with its various List Serves (e.g., SBIG for imaging, IOTA for occultations, MPML for asteroid light curves, etc) is a wonderful source of ideas, information, and collaboration. I have published my work in various journals, given at talks and seminars, and make most of my papers available on this web site. · Asteroid light curves. Measuring the rotation rate of asteroids by measuring the light variations from the asteroid as the irregularly shaped objects rotate. These results are published in Minor Planet Bulletin. · Asteroid Occultations. As asteroids move through the sky, they occasionally pass in front of stars, thus blocking the starlight. Observing the time duration of the "eclipse" gives a direct measure of the size of the asteroid along one chord. With coordinated observations by multiple observers, the shape and size of asteroids can be measured very accurately. · Photometry. I have long been interested in high speed (as fast as 1 ms) photometry and have developed instruments for this purpose. I am particularly interested in looking for high speed light variations in certain stars. · Interesting Imaging. Planetary Nebulae present a wide variety of forms and many are challenging (large and faint) to image. I have imaged most planetaries of over 1 a-m diameter, and continue to refine the images. Occasionally I will image a particularly interesting galaxy to add to my own collection. And there are often comets or other objects that beg to be imaged (which I do my best to oblige). · Spectroscopy. Using the N18/DSS7 combination, I can take spectra to about mag-14 and even fainter for line emission objects. Comets are particularly interesting as they change with time, and vary greatly from one to another. · Serendipitous Discoveries. Measuring asteroid light curves may require a continuous string of hundreds of images, every 2-3 minutes, all night and on multiple nights. As the asteroid moves through space, the star field near the asteroid will, of course, change. At least several times a year, I will discover a new variable star or other object. In some cases, I will take up the challenge of measuring the characteristics of the star (period, type of variable, spectrum type).